The University of Toledo will celebrate LGBTQ History Month with several events in October. The Office of Multicultural Student Success, LGBTQA+ Initiatives and Prism are dedicated to serving the needs of the lesbian, gay, bisexual, transgender, questioning and allied students. • Monday, Oct. 1 — Film Screening, “Forbidden — Gay and Undocumented: Moises Serrano Fights for Justice,” 7:30 p.m., University Hall Room 4280. Follow the story of Serranos, an undocumented gay man living in rural North Carolina. This event also is part of Hispanic Heritage Month. 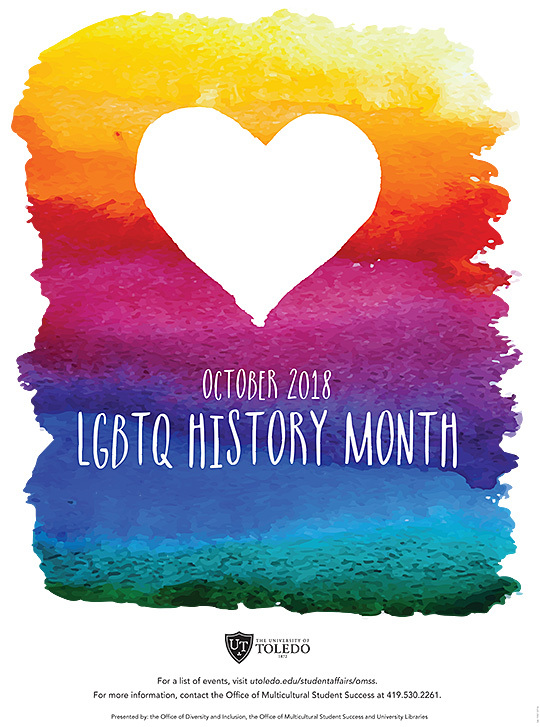 • Tuesday, Oct. 2 — LGBTQ History Month Kickoff, 11 a.m. to 2 p.m., Centennial Mall. Stop by and see the flags of the LGBTQA+ community. Learn the history of the flags, pick up a free button, and have a rainbow cookie. • Thursday, Oct. 4 — Prism Coming Out Meeting, 8 p.m., Thompson Student Union Room 2591. • Monday, Oct. 8 — Film Screening, “The Watermelon Woman,” 7:30 p.m., University Hall Room 4280. Charlene Gilbert, dean of the UT College of Arts and Letters, will lead a discussion about the 1996 film that researches an obscure African-American actress from the 1940s billed as “The Watermelon Woman.” Gilbert worked on the movie. • Monday, Oct. 15 — Film Screening, “Frida,” 7:30 p.m., University Hall Room 4280. Watch the biopic drama about surrealist Mexican painter Frida Kahlo. This event also is part of Hispanic Heritage Month. • Tuesday, Oct. 16 — Drag Queen Story Hour, 6:30 p.m., Carlson Library Children’s Section, located on the third floor. Brook Lockhart will host this event open to all ages — adult must stay with children younger than 12. Stories will be targeted at elementary schoolchildren, but the messages will resonate with kids of all ages. Harvey House of Northwest Ohio is partnering with the University for this monthly program. • Thursday, Oct. 18 — LGBTQA+ Initiatives TED Talk, 5 p.m., Thompson Student Union Room 2584. The Office of Multicultural Student Success will lead a guided panel discussion. • Monday, Oct. 22 — Film Screening, “Screaming Queens — The Riots at Compton’s,” 7:30 p.m., University Hall Room 4280. Watch a documentary about transgender women and drag queens who fought police harassment at Compton’s Cafeteria in San Francisco in 1966. • Wednesday, Oct. 24 — LGBTQA History Month Keynote by delfin Bautista, 6 p.m., Thompson Student Union Auditorium. Bautista is the director of the Lesbian, Gay, Bisexual, Transgender Center at Ohio University. Multiple faith beliefs and their connections in the LGBTQA community will be discussed. A question-and-answer session will follow his talk. • Thursday, Oct. 25 — Prism Drag and Talent Show, 7 to 9 p.m., Thompson Student Union. Interested in competing in the talent show? Email prism.utoledo.@gmail.com. • Monday, Oct. 29 — Film Screening, “Pride Denied — Homonationalism and the Future of Queer Politics,” 7:30 p.m., University Hall Room 4280. Queer and trans activists and artists call for a return to prioritizing political activism and community support that characterized the emergence of the contemporary LGBT rights movement more than 40 years ago. The Monday films will be shown in partnership with the UT Department of Women’s and Gender Studies. For more information, click here or call the Office of Multicultural Student Success at 419.530.2261. This entry was posted on Monday, October 1st, 2018 at 4:00 am and is filed under Arts and Letters, Events, News, UToday .